Testimonials from those who know. ....I started out crewing for my sister but quickly learnt to helm myself. I used to sail whenever I could at weekends, after school and in holidays. To put the story of sailing with Tyson into context, first I must briefly tell the story of sailing with Sidonia. 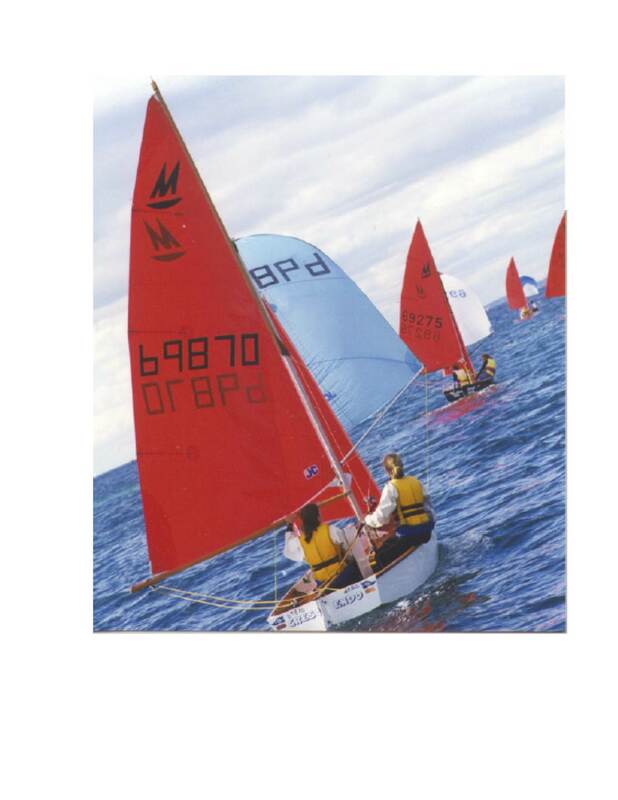 I had sailed as a child but never really competitively, then after a 25 year break my adult sailing journey began when Sidonia, then 9 years old, agreed to crew for me on a Mirror dinghy. Together we learned, improved and enjoyed some success together. Sidonia and I sailed in two world championships, came third in the 2013 Nationals and the next season won the State Championship. Whenever there were presentations Tyson was the trophy collector and by the age of 7 he was champing at the bit to sail. Sidonia, now 13, had the skills and confidence to helm so Tyson became my crew. Sidonia’s hard and often frustrating work training Dad immediately paid dividends for Tyson. He thought this sport was a breeze - just sit on the boat, pull a few strings and watch the rest of the fleet disappear astern. At the first regatta we sailed in and won there was prize money and we split it evenly as I had done with Sidonia. Tyson was wide eyed as he counted the crisp bank notes, not only was sailing easy and fun but it paid well too! When we won the State Championship in his first season he immediately claimed this as clear evidence of his superiority as a sailor in comparison to his sister. After a season and a half sailing together we all headed to South Africa to compete in the 2015 World Championships. In the month before we left Tyson would tell me at least once every day “Dad, I really want to win the World Championships.” Disappointment is an extremely bitter pill to swallow for a competitively natured eight year old so I set about managing his expectations explaining that this wasn’t like club racing or even the State Championships as we would be competing against the best Mirror sailors in the world and just getting in the top ten would be a terrific achievement. The next day he would say again, “Dad, I really want to win the World Championships”. Certainly there was no lack of ambition or desire. The first surprise at Theewaters was how windy it was as the pre-worlds practice race was sailed in 20-25kts. If every day was like this I worried that the scheduled three races might test Tyson’s endurance, he doesn’t like being cold and minor injuries tend to escalate into catastrophic proportions. I gave him the usual heavy weather briefing as we sailed out, “Tyson, the wind is very strong today and there are big waves. It’s important that you do exactly what I say when I say so you don’t get hurt. Understand?” He nodded dutifully in reply. This is a significant parental coup as it’s the only circumstance in which I have ever managed to achieve his complete and immediate obedience. We came a close third in the practice race and now I had a real problem as all that expectation management immediately went out the window. Ashore even Sidonia said, “You’re going to get top three Dad”. I kept trying to pour water over the building flames, however, when we won the first race of the pre-worlds regatta even my anticipation began building. We were fast in a breeze and it seemed if these conditions persisted we might have a chance at a podium finish. The wind held in for the next two days of the pre-worlds regatta but as a team we had some problems. A capsize (Tyson’s first ever) on the first beat of Race 3 and a pin end starting disaster in Race 5 that saw us last over the line threw up challenges but we recovered in both and scored all top 10 finishes to end up 5th overall. I was very proud of my brave, little crew. While I would take a few moments to get settled after the top mark bear away Tyson would ask impatiently, “Are we going to put the spinnaker up?”. A fearless is an immensely liberating asset for a naturally cautious parent and helm. Tyson had worked hard, complained relatively little and only cried for a short time after sustaining the usual minor injuries. I was very proud of him and just as proud of Sidonia who had finished every race with no capsizes, helming in her first major regatta in very difficult conditions, for a mid-fleet finish in 24th overall. We won the worlds practice race comfortably in 18-22kts and were pumped to get some good results on the board early. When we arrived the next day it was blowing 25-30kts so we waited. At 3pm racing was abandoned and by 4pm the wind had moderated to 18-22kts…dang! The schedule was changed to start an hour earlier the next day and we were on the water for an 11am start but the wind didn’t turn up. After bobbing around for an hour and a half in the stillness and heat racing began and we struggled in the light and shifty conditions scoring a 16th and 12th. Then the breeze filled in and we tasted success with a 2nd place. In the fourth and final race of the day we were caught under lay at the top mark and had to tack back three times while about 20 boats passed us, but we worked our way back to 17th place and were surprisingly placed eighth overall. Day three was very hot and again no wind, but at least this time we got to wait on shore. After two and a half hours we finally began racing in 3-5kts, which then filled in from the south halfway through the first race to a glorious 12kts. We were the first to sail into the header towards the new wind and went from 20th to second place. The breeze continued to build to 18kts and we finished the day with another 2nd followed by a 4th place to win the ‘Europe Cup’ day prize and jump to 3rd overall. Racing on Day 4 began in light air. In the first race we were coming 6th when the breeze died and then filled in on the right hand side when we were left and we dropped to 17th. In the next race we were 7th and got into a luffing duel on the reach with Andrea, the South African 470 hot shot. We were protested for rule 11 and did turns falling back to 14th place. This was all too much for Tyson, he was crying and couldn’t understand why Andrea was being mean to us. He said the words I had been dreading “I don’t want to sail anymore”. I told him that I didn’t want to hear that, we had come all this way to sail and we would keep sailing and try harder in the next race. He switched back on in time for the start and his persistence was rewarded with a 4th place and then our first win in Race 11 to finish the day. Tyson was all smiles, “Are you happy we kept sailing?” I asked. He nodded enthusiastically in reply, an important lesson in resilience had just been learnt. The World Champion title had been successfully defended by the local favourites without them having to sail the one remaining race on the last day but for the boats sitting second to ninth, there was certainly plenty to sail for. After eleven races we were in fourth place with two British all-girl crews ahead of us by two and nine points. Fifth place was nine points behind us, we would have to work hard to hold our position. Now that first place was beyond our reach Tyson had taken to repeating, ad nauseum, that he really wanted to come second. I found myself again trying to keep a lid on his expectations, which were considerably raised after our win in the previous race. I said to Tyson we would focus on sailing our best for the last race and then see what happened. The ‘usual’ conditions at Theewaters, a north-westerly morning land breeze, had appeared for the first time since we had been here and the locals expected it to die by the scheduled start time. No AP was flown ashore so we launched. With a minute to go the breeze built to 12-15kts which was enough to get us to the top mark in second place behind Douglas and Charlotte, the father and daughter Sydney-siders. We both held our respective positions racing for an hour, then one-third the way up the last beat the wind died completely. I looked at my watch, 25 minutes to finish within the time limit. I subconsciously willed the PRO, “please do not abandon”. If you want to torture an 8 year-old boy then insist that he sit very still and be quiet. After telling Tyson questions like, "Can we put our legs out of the boat and kick?" and repeating, "I really want to win" aren't helpful, he lay down on the foredeck in silence. About ten excruciating minutes later the boats behind and to the right started to move as the new wind began to appear on the right. We just got our nose into it enough to cross in front of the World Champs and to tack back in the 2kt southerly. I felt for Douglas and Charlotte who were still completely becalmed to leeward. With a puff approaching on our starboard quarter we popped our kite up about 50m from the committee boat and pulled clear ahead of the boat coming in from the right as we rounded the committee boat for the win. The British girls we had to beat had rounded the bottom mark 9th and 10th , stopped while tacking in the calm and then went in reverse to finish well back in the fleet. We had moved into second place overall. After crossing the finish line I threw Tyson into the lake, much to his delighted surprise. When I luffed to haul him back into the boat the spinnaker backed and we started to move backward towards the committee boat. I thought we had cleared the finish line and the race committee were all laughing but I carefully and narrowly avoided contact with the mark, apologised and then sailed clear before allowing Tyson to push me off too. We collected the boxing kangaroo flag from our support boat and Tyson stood waving the flag as we sailing back to shore much to the delight of a very proud mother and wife. On the way back in Tyson said spontaneously, "This is the best day of my life", a big call for a little boy. It was a good one for me too. On shore Sidonia ran to congratulate me and I could tell she was genuinely delighted for us but I also knew deep inside she would be wishing it had been her. I told her our success was as much hers as it was Tyson’s because if she hadn’t done the hard yards and put up with me while I made mistakes for years, then Tyson and I could never have achieved what we did in South Africa. It wasn’t until we were home that she verbalized her frustration, “five years in that bloody boat and he gets this first time”. Such is the lot of an eldest child. …and displayed them proudly next to his bed that night. The shared experiences I have had sailing with my children on our Mirror dinghy, have been amongst the most rewarding moments of my life. Sailing with Sidonia was very different than with Tyson as she was always quietly in a world of her own on the boat and I knew everything was ok in her world if she was singing to herself. My enthusiasm always dragged her along even when she didn’t really want to sail, although she would never tell me that. I was both very proud and delighted when she decided to continue her own sailing journey completely of her own volition. Tyson is driven by a strong desire to win. He is internally motivated and stronger and braver than he at first appears. He is coming to understand that real success requires considerable effort and that success achieved through persistence and effort is immensely rewarding. Tyson is also beginning to learn that the most important function of a crew is to not distract the helm, however, the helm’s chatter filter will be needed for a while yet. It is a joy and a privilege to sit alongside him and watch his character develop. I look forward to the rest of my sailing journey with Tyson and we already have our sights set on going one place better in Cornwall, UK, in 2017.